Here at Lake Ridge Golf Course we act as the headquarters for The First Tee of Prince William County. Part of that is we collect donations of all types for The First Tee Program. Over the years we’ve seen many different types of golf balls and clubs brought in to either turn into a participant set or to re-sell for monetary donations. 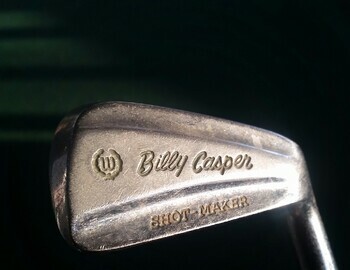 Recently, I stumbled across a particular club from a Wilson Shot Maker series with Billy Casper’s name on it. As you may know, we are a Billy Casper Golf managed property. Billy Casper was somewhat overshadowed by the competition he faced during his career. However, he still had a stellar career despite the competition of Gary Player, Jack Nicklaus and Arnold Palmer. Casper finished with 51 PGA Tour wins, seventh all-time. Among those wins was the 1970 Masters Tournament and two U.S. Open Championships, 1959 and 1966. He also finished second at the PGA Championship three different times, 1958, 1965 and 1971. All in all, Casper finished with 69 professional wins and was elected into the World Golf Hall of Fame in 1978. Clearly, “Shot Maker” was a fitting name for his Wilson club series. Outside of his golf career, Billy Casper had 11 children (six of whom were adopted) and 71 grandchildren. He started “Billy’s Kids” a charitable foundation for kids and hosted an annual tournament to raise money for the charity at San Diego Country Club. Billy Casper passed away at the age of 83 from a heart attack on February 7, 2015. Share your thoughts and memories on Billy Casper’s career on our Facebook page. For more information on The First Tee of Prince William County, visit their website or call the golf shop at 703-494-5564.